Maximum Accuracy Cutting-Edge Solution with U.S. DOT Number Reading for Automation and Collection of DOT numbers used for Truck Identification, Pre-Screening, Inspection and Enforcement/Compliance Monitoring. The SeeDOT system automatically monitors commercial motor vehicles entering and exiting controlled areas such as: Ports of Entry and border crossings, or weigh in motion stations along highways, secure parking facilities for trucking, and other sensitive installations, along with fleet management applications. 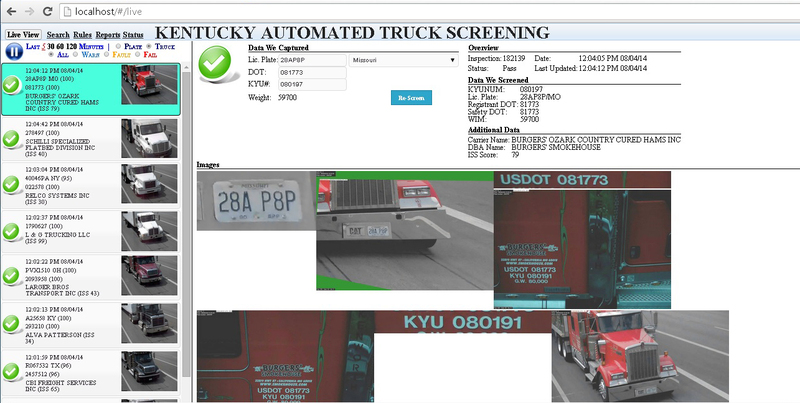 Example of a screen shot of one of the dozen weigh stations deployed in Kentucky is seen here. The system reads the DOT number, license plate and state ID, and alerts on vehicles of companies that require inspection. Thus, random checks are replaced by targeted inspections, resulting in efficient monitoring and enforcement.